Nyck De Vries has set the pace on the final day of the Formula 2 test at the Bahrain International Circuit, grabbing the top spot in both sessions as he denied his rivals twice over, with a time of 1:40.583, just seven thousands ahead of Nobuharu Matsushita and Oliver Rowland, in the morning session, and with an afternoon time of 1:41.880, ahead of Rapax teammate Johnny Cecotto and Norman Nato. The morning session opened under overcast conditions and slightly cooler temperatures than seen for the last two days, with De Vries clearly enjoying the elements as he set the early pace. The PREMA pair of Charles Leclerc and Antonio Fuoco soon took over on top, with the Italian the first to drop below 1:41. At the one hour mark yesterday's quickest driver Nicholas Latifi grabbed the top spot, but teammate Oliver Rowland had his eye on the prize: the Briton dethroned the Canadian by just eight hundredths, with Matsushita soon splitting the DAMS pair, indicating the fine margins between the teams, but with just over a half an hour remaining De Vries stole past them all, grabbing P1 by just 0.007s. Following a one hour break the pitlane was green again, with de Vries the first man on track as he looked to resume hostilities. Artem Markelov topped the timesheets in the opening stages before the Pertamina Arden of Sean Gelael and Nato took over, but on the one hour mark Cecotto went top, ahead of De Vries and Nato. 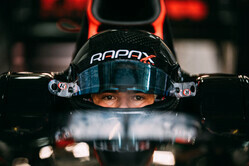 The Dutchman bided his time before striking in the final hour, again grabbing the top spot with Nato closing in to P2, but Cecotto reclaimed the position just before the chequered flag to hand his Rapax team a 1-2 in the final session before the opening round of the season, to be run in Bahrain in just 2 weeks' time, on 14-16 April. Liberty Media seeking other motor sport series?